If you can imagine it, it can be created. 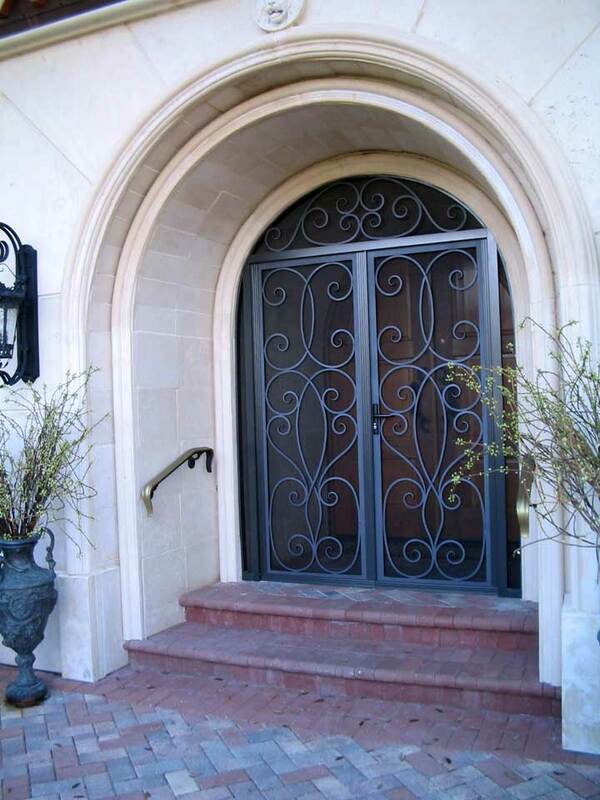 Renaissance Iron specializes in metal design work for Interior Decorators, Contractors and private art lovers. 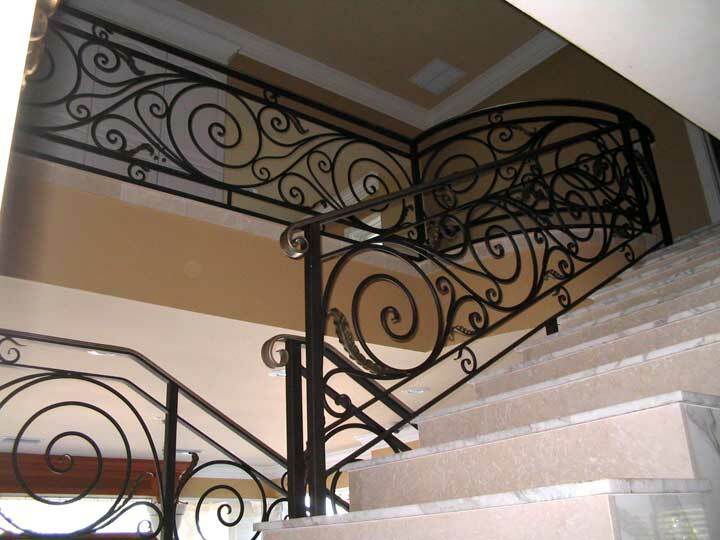 Whether you need a standard railing or a custom piece, Renaissance Iron will be happy to work closely with you to fulfill your every need. With a wide range of finishes and designs, the only limit is your imagination. No job is too big or too small for this celebrated artist. 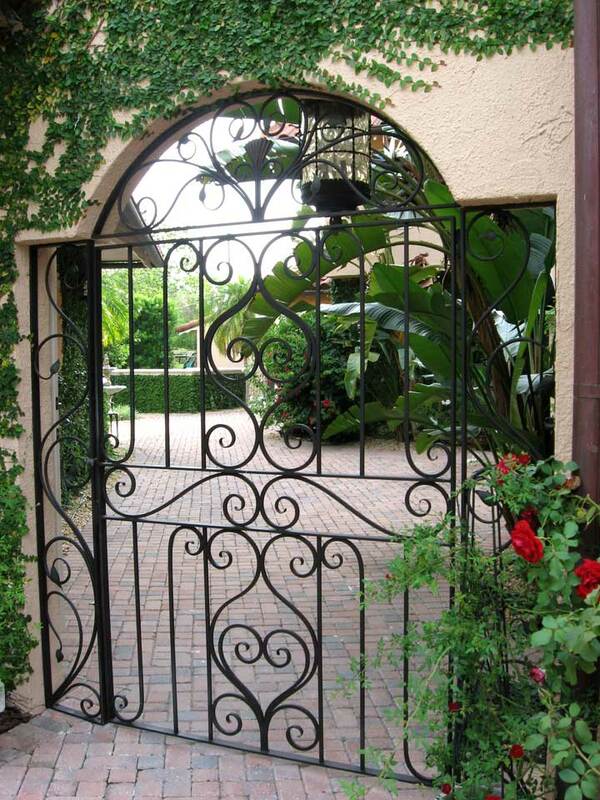 Located in central Florida, Renaissance Iron can help you select the best solution for your project. Rick Sgrillo's art pieces are decorating the landscape all over Florida, including Disney World, Bok Tower Gardens, Cypress Gardens and in many commercial buildings and private homes. We invite you to peruse through the photos below to give you a better idea of the true artistry that goes into each and every piece of work. 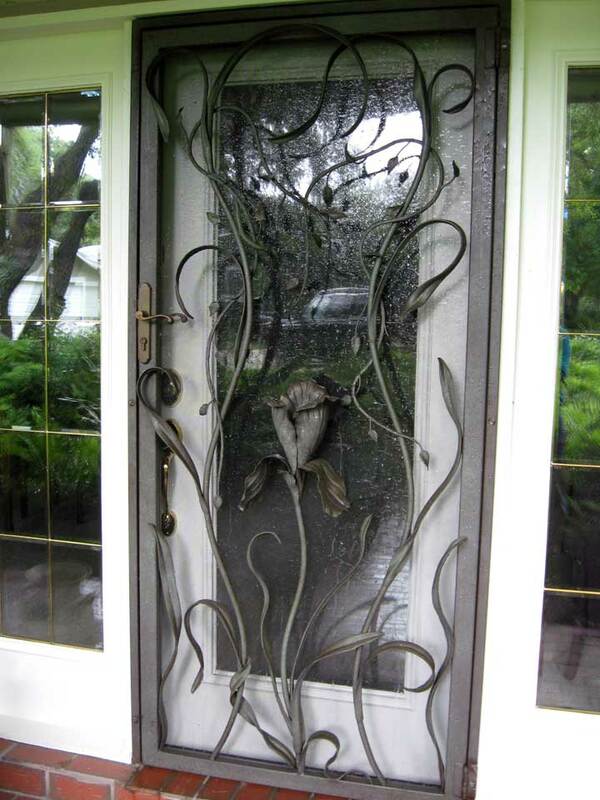 This custom-shaped gate is an original design that includes symmetrical scroll design and a vine/leaf trim. Very pleasing to the eye, this popular gate makes heads turn for a double take and closer scrutiny. "Thanks for your diligence and care to get this project done within budget and on time. We will definitely call you for more work on our upcoming construction projects." "We get so many compliments on our new staircase. We just love it! Thanks again for spending so much time with us to give us even more than we ever imagined." "Every time I look at my new railing, I can't believe it's really mine. Can't wait to show it off next weekend during my pool party." 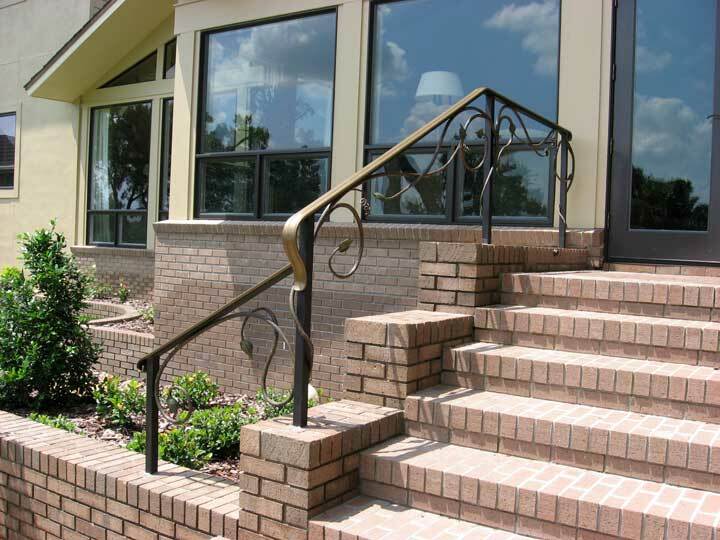 This combined balcony and staircase railing is a good example of the unique designs that Renaissance Iron can custom build for any commercial building or private home. 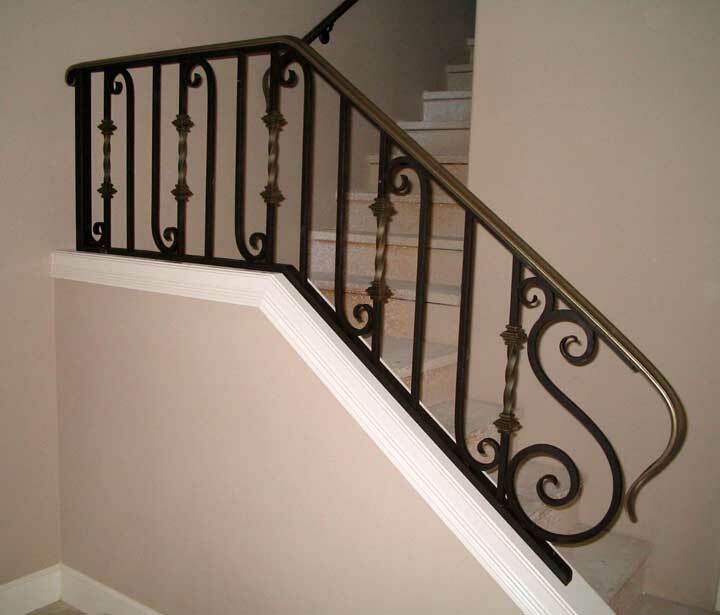 Artisan, Rick Sgrillo, works well with Contractors and Interior Decorators to design and install staircase railings and balconies for new construction or existing homes. Many people stop to stare at this elegant railing. Most of the time you can overhear them call over a friend to see it. The admiration starts with close inspection and usually turns into lots of touching and head nodding. 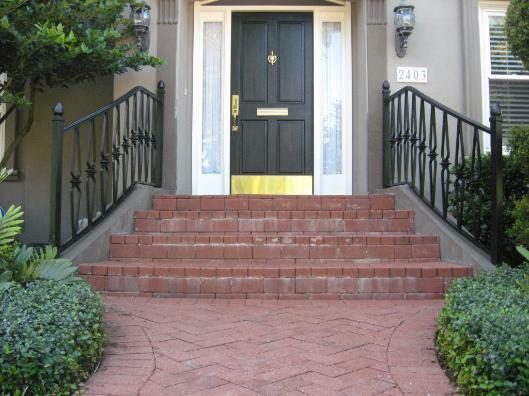 Outdoor railings can bring a touch of functional art to exterior landscapes. 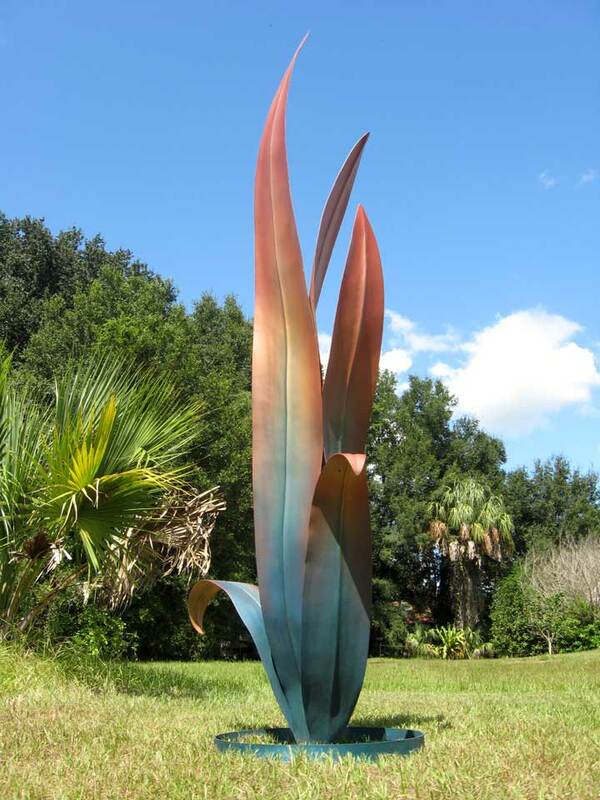 Crowd pleasing sculptures, designed by Rick Sgrillo, adorn the grounds at Bok Tower Gardens in Lake Wales, Florida. 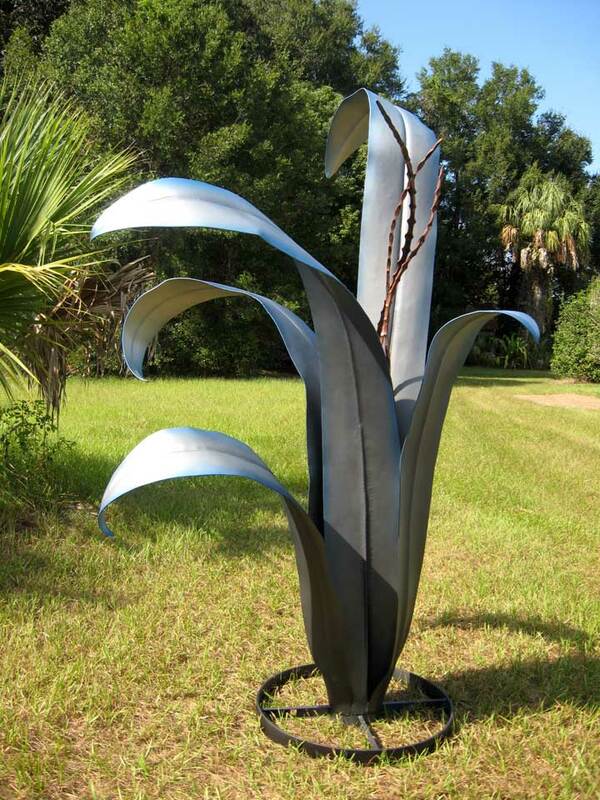 The unique plant-like structure gives the hard metal a smooth fluidity that is appealing to nature lovers everywhere. Cameras go off every time visitors at Bok Tower Gardens stumble upon this blue beauty. The immense size and sheer magnificence of this sculpture keeps visitors coming back for more. 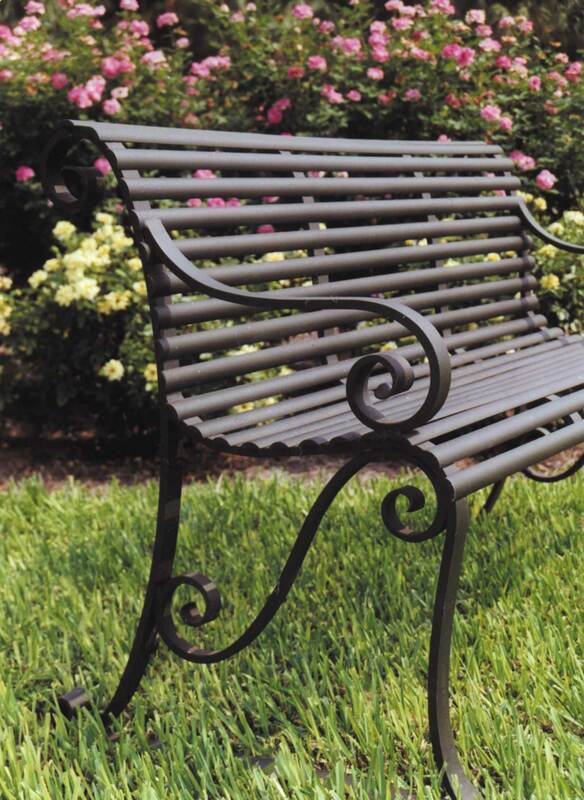 Forged out of the Renaissance Iron studio in Lakeland, Florida, over 100 custom-designed benches are strategically placed along the winding paths and rollings hills of Bok Tower Gardens. Visitors can rest their feet while enjoying the sights and aromas of the floral bounty before them. Each bench has been carefully designed to best fit the human form for optimal comfort. If you visit Bok Tower Gardens in Lake Wales, Florida, be sure to also check out the children's play area adjacent to the parking lot. There you will find a spectacular round tree house and a large metal dome tunnel covered with vines that Rick Sgrillo designed for the kids. 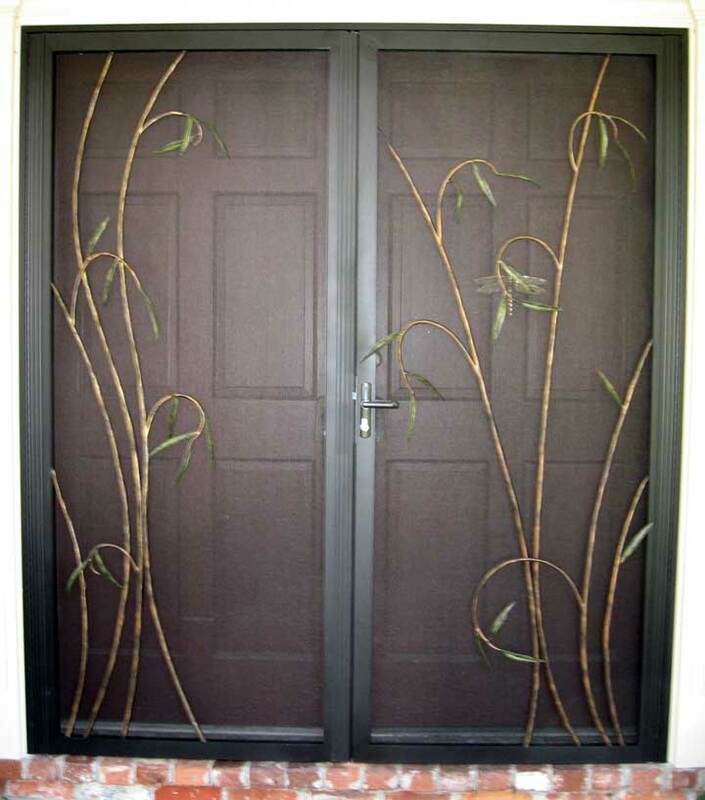 This bamboo screen design is not only welcoming for any entryway, it creates a touch of whimsy to any decor. 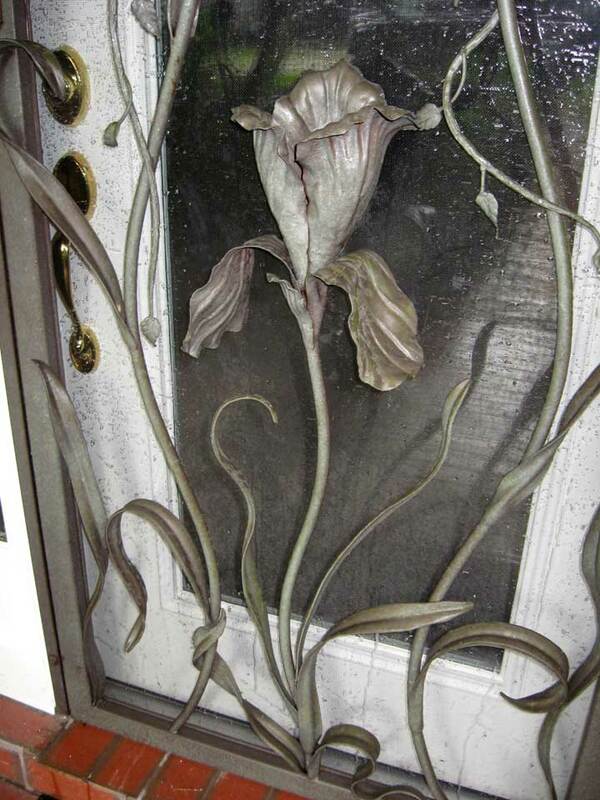 Nature lovers everywhere can appreciate the stunning workmanship that went into this floral screen design. The closeup of the Floral Screen design shows the artistic flair to each leaf and flower feature. 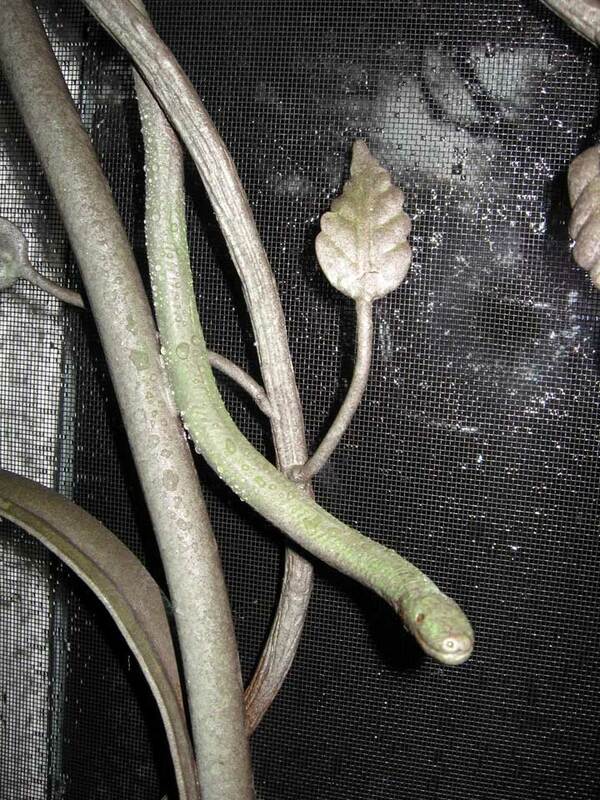 Artisan, Rick Sgrillo, may surprise you with unexpected whimsy as shown above with the addition of a forged snake, with slight coloration, among the vines. Tucked under a massive archway, a simple, yet elegant, gate adorns the entryway and complements the existing architecture. 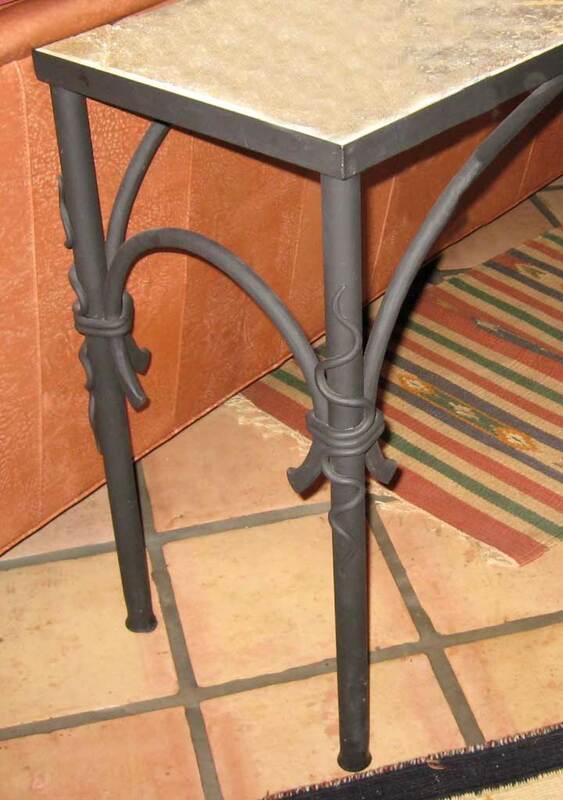 This table leg is a prime example of the unique touch that artisan, Rick Sgrillo, puts into each of his designs. Each piece is a one-of-a-kind work of art enjoyed by art lovers of all ages. 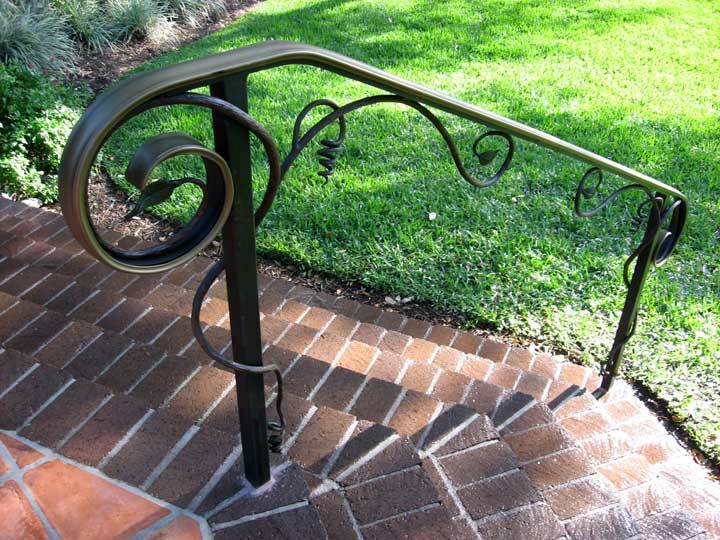 This residential set of railings contain custom made pickets within the curved rails. 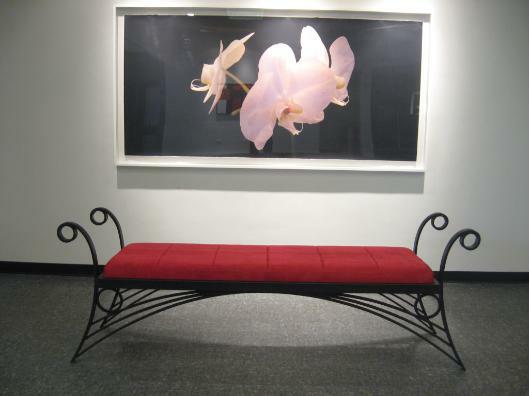 Eight of these upholstered gallery benches were made for a college art gallery's lobby. All photo images are copyright 2009 Renaissance Iron and can not be used in any way without written permission from Renaissance Iron. All rights reserved.